Think an annualized quarterly GDP of 8.9% is great? Maybe not for China! And don’t think that it’s because of high expectations. 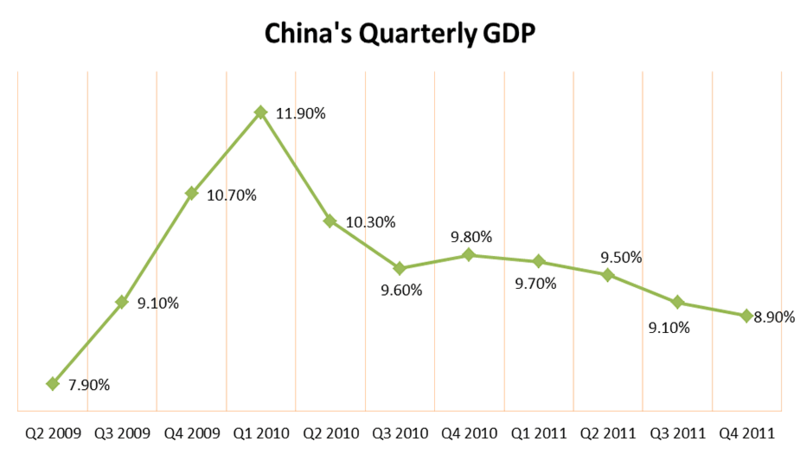 Yesterday we saw China’s GDP for Q4 2011 come in at an annualized rate of 8.9%. The number is lower than the 9.1% figure we saw in the third quarter, but is still above the 8.7% growth that market geeks were expecting. Given the situation of the global economy, with countries struggling with the sovereign debt crisis and possibilities of double dip recessions, you’d think that China would be happy with its growth. However, unlike investors who got giddy buying higher-yielding currencies yesterday, Chinese officials seem disappointed. We all know that an 8.9% quarterly growth isn’t bad at all, but for China, the figure translates to the slowest pace of growth in 10 quarters. You read that right – TEN quarters. The world hasn’t seen China’s economic growth print below 9.0% since the mid-2009 when we were busy watching Star Trek’s USS Enterprise teleport its way to theaters! According to the National Bureau of Statistics, the cooling real estate sector is partly to blame for the slowdown. The annualized growth in real estate investment was only 27.9%, lower by 5.3% than the figure for 2010. Analysts also point to uncertainty in the global economy for taking a toll on exports. For instance, income generated by exports to the European Union, only grew 7% year-on-year after expanding by as much as 22% in the middle of the year. The PBOC’s rate increases also took their toll on growth. At the start of 2011, China was armed with a growth rate of 9.7% and a new year’s resolution of fighting off inflation. The central bank finally succeeded in taming CPI, bringing it down to 4.2% by the end of the year from its 6.5% peak. Consequently, GDP trickled lower to 9.5% in Q2, 9.1% in the third quarter, and finally 8.9% in the last. Another possible reason why Chinese officials aren’t happy is because it seems like the economy hasn’t hit rock-bottom yet in Q4 2011. It’s no secret that the European Union, China’s largest trading partner, is still grappling with its debt crisis now. Unless we see any concrete solutions made, I don’t think we’ll see Chinese GDP skyrocket back up to 11.0%. And I’m not the only one who thinks so too! A few economic gurus think that the worse is yet to come for the economy in 2012. Market junkies crunched the numbers and estimate that growth could fall well below 8%, there are those who even predict an annualized growth of 7.5% for the year. 3. Political crisis in the cards? Political gurus say that keeping a minimum growth rate of 8% has been the primary assumption of the Communist party’s economic policy. They even say that should we see the expansion fall significantly below 7%, China could suffer a political crisis as well! For now the government might want to focus on projects involving infrastructure, exports, and residential housing, which are some of the economy’s biggest problems. After all, with China’s growth engines starting to show weaknesses, the least the government can do is to soften the economy’s landing to a slower, more stable growth. However, given all these, do you think China will be able to pull off a soft landing? Will we see a soft landing for China in 2012?